We’re experiencing an odd shift in the family’s popcorn making lately: we’re starting to make retro-popcorn. By that, I mean that we’ve stepped away from our most frequent methods for making popcorn, and returned to older methods. When I was a kid, we traditionally ate popcorn for Sunday night dinner. Part of the evening’s entertainment included watching the process of making popcorn. Like most American homes in the 1960s, we had a clear plastic domed hot plate popcorn popper. 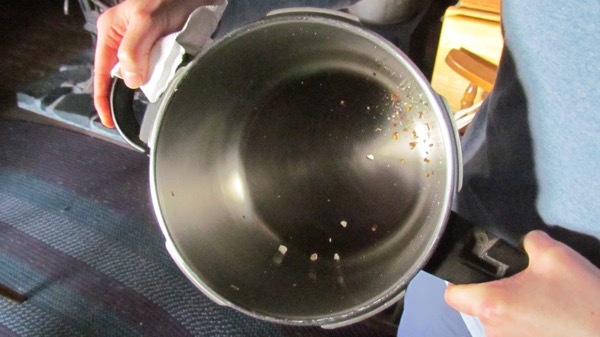 A parent poured popcorn into a puddle of vegetable oil and plugged the hot plate into the household electricity. The element heated the oil, and eventually the popcorn popped. My brother and I watched carefully for the first kernels to pop, followed soon after by all the rest. 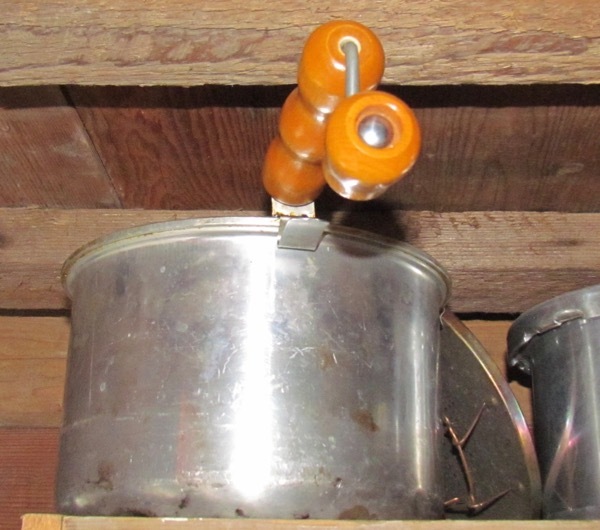 One of three Whirly-Pop-type popcorn poppers we have on the homestead (Photo: Mark A. Zeiger). Since then, Michelle and I have tried almost every innovation in popcorn poppers, including the hot-air popper, the Whirly-Pop, and more. Occasionally, we’ve enjoyed pan-popped corn, usually on my brother’s and sister-in-law’s boats. They pop corn on their wood-fired cook stoves in cast iron skillets, covering them with a heavy lid and shaking the skillet over the flame to pop the corn. We’ve mostly used Whirly-Pop popcorn makers for about 25 years. Our first one got opened as an early Christmas present when Aly was very small, during a power outage that led to our family’s Pioneer Night tradition. Lately, though, we’ve all gravitated more or less independently to pan-popping popcorn. This might be because Aly and her boyfriend commonly make popcorn at his place with a pan, and the gears of the Whirly Pop crank, while made of high-impact plastic, begin to slip badly after years of use. We’re still perfecting the process, but we find that using one of our pressure cookers, which have heavier bottoms, work best. The heavy bottom not only prevents the popcorn from burning, but holds heat longer, popping a lot of the slower kernels even after removal from heat. 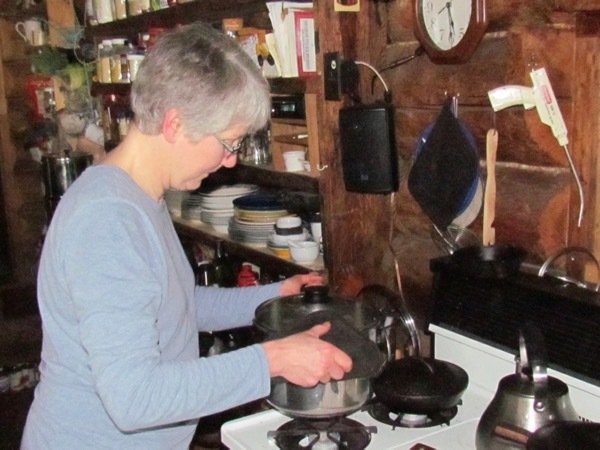 Michelle makes pan popcorn with a pressure cooker (no pressure cooking lid, this one comes with an extra, clear lid for regular cooking) (Photo: Mark A. Zeiger). We sprinkle some oil in the bottom of the pan (usually vegetable oil), dump in a half cup of fresh kernels, and set the propane burner on medium, roughly. We then agitate the pan over the heat, raising it above the flame as the kernels start popping well. When we’re done, we have almost no “old maids”—unpopped kernels, and no scorching or burning with the pressure cooker. We’ve tried a few other pans, and have burned and scorched the bottom in the process. It’s a bit more labor intensive, but we really shouldn’t be eating popcorn in the first place (see Popcorn, The Homesteader’s Nemesis) so a higher work requirement may prove a good thing. What’s left after popping the last batch of popcorn (Photo: Mark A. Zeiger). Moving to “retro-popcorn” isn’t a formal family decision, just a general tendency. But, I’d bet it might stick. As it were . . . .